Musicians, and people in the Arts, tend to be big hearted souls. We want to share these beautiful creations with as many people as possible. We tend to want to help people in need. Musicians and music educators want young people, and “old” people who never had the chance, to experience making music because we know the change it make in someone’s life. We want to “save the music” and bring as many people as possible along for the ride. I’ve been involved with playing music for… Wow… over 40 years, writing music for almost that long and teaching music for over 30 years. So, I have a lot of first hand experience at the joy music can bring to the life of a wide range of people; from beginners to pros, from young to old. I’m not going to spend time reviewing the studies on the impact music has on people. Playing music has numerous positive benefits and it’s fun. That’s enough for me to want more people to be musickers at all levels. FreeMusicBook.com just started this year (full disclosure- was started by a company I’ve worked for many years) and is bringing together; music publishers, music supporters and people who want to learn music. Anyone who wants a free music book can get one. We are, currently, the only publisher offering a free book since this is just at the start. But, we forsee many music publishers and music app developers joining us soon. We’d love to give people a number of free music books and apps to get them started. 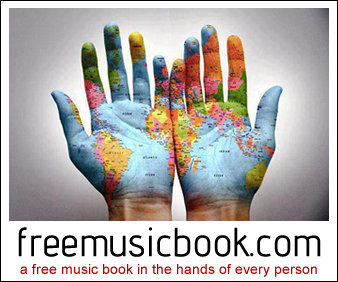 Please join FreeMusicBook.com as a; Publisher or Promoter. Or, just stop by to get your Free Music Book. Please help, by spreading the word and join our initiative by signing our petition to get a free music book to everyone that wants/needs one. Not necessarily a songwriting post, or interview, today. But, the more people we have involved with music the more music supporters we create. As always, thanks for spending some time here.